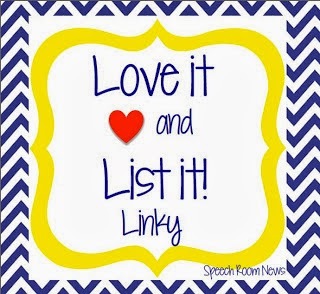 Jenna over at Speech Room News blog is hosting a "Love it and List it! 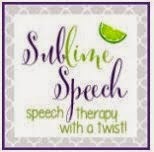 Linky Party" for speech-language pathologists to share their frequently used vocabulary resources. Direct vocabulary instruction is a major part of my language therapy sessions with my elementary school aged students. I am not a fan of using worksheets to address language skills with my students. 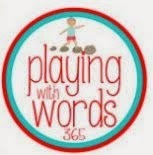 It is more effective to use quick learning games that maintain their attention during their 30 minute sessions. When I do use worksheets it is to collect baseline (pre-intervention) data, to monitor progress, or for homework. There are so many activities that I use to work on this skill. Here is a picture of some of my frequently used materials to target increasing the vocabulary skills of my students. I enjoy using these materials because I am able to readily differentiate the content of my group language therapy lessons by tailoring my students' language practice to their individual learning needs. So basically, each student can work on different skills during a 30 minute group. Last year, I started using a series of photocards called Double Dice Deck. Students spread the cards on the table and roll the dice. It is called double dice because the outer dice has shapes and the inner dice has numbers that correspond with the questions on each card. I have my students select a card by the shape only and then verbally define the item. I love using the Define and Describe Double Dice Deck to provide guided/independent practice opportunities for my students to define vocabulary by attributes. I pair this with a graphic organizer that lists the attributes they can use to explain their word. This series has a deck to target naming synonyms and antonyms. Students select what set they will work on based on their IEP objectives. I like these cards because it provides sentences with a highlighted word in red or blue that the student has to read and replace with the correct synonym or antonym. I typically just have them name either 1 or 2 similarities or differences based on their IEP objectives. I also provide direct instruction of multiple meanings vocabulary: homophones and homographs on a regular basis. My students love the photos in my Beach Themed Multiple Meanings activity and enjoy verbally describing the definitions of the terms. We also play a memory game to help reinforce identifying the terms. 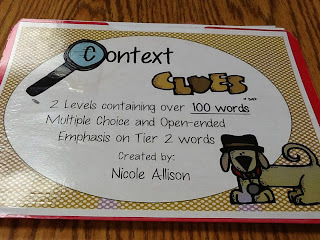 In order to facilitate the use of more critical thinking skills, I frequently use Nicole Allison's TPT Context Clues product. I like this because there are questions targeted for Grades 1-3 and then 4-8. My students enjoy pretending to be word detectives as they look for clues to figure out the meanings of the underlined word. I am quite pleased at the progress that my students with learning disabilities and autism have made using this resource. Let's not forget about the Common Core Standards. I use task cards I created for my 2nd, 3rd, and 4th grade students that address a variety of skills from story elements vocabulary, parts of speech vocabulary, figurative language vocabulary, prefixes, suffixes, etc. Thanks for reading my blog! I'll see you next time.